Since the end of WWII and the liberation of the camps in 1945, the issue of prosecuting Nazi war criminals and historical justice has elicited major public interest, and many stories have been linked to the topic over the years. The apprehension and trial of Adolf Eichmann in Jerusalem in the early 1960s raised the issue of the place and involvement of the State of Israel and its intelligence services in the effort to deal with Holocaust criminals. Yad Vashem's Archives recently unveiled to the public an extensive study on the topic written by the Mossad’s history department. "The Pursuit of Nazi War Criminals" summarizes more than three decades of the organization’s activities on this matter, relying on the classified documents that had been kept top secret in the Mossad’s archives over the years. The first part of the study maps out how the Mossad handled the issue over the years, and the changes that occurred in every era under the policy of its directors and those that appointed them, the prime ministers of Israel. A concise summary of the Mossad’s efforts at pursuing Nazi war criminals, the study deals with the organizational structure of the various units that ran the intelligence-gathering operations, and prepared and carried out missions from 1959-1991. The second part of the study describes eight stories of surveillance and pursuit of different Nazi fugitives, above all Hitler’s secretary Martin Bormann, one of the top members of the Nazi Party and the highest-ranking Nazi fugitive whose fate is unknown. Besides Bormann, the research describes the pursuit of the Gestapo head Heinrich Müller; the Nazi physician Horst Schumann; Alois Brunner, one of Adolf Eichmann's aids; Walter Rauff, who was responsible for the production of the gas vans; Gestapo Head in Lyons Klaus Barbie; Franz Murer, who was responsible for the murder of the Jews of Vilna; and Ernest Lerch, who was in charge of the destruction of the Lublin Jewish community. The study details factors and circumstances that explain why each of the criminals went unpunished. The third part of the study is dedicated entirely to a comprehensive summary of the uncompromising yet fruitless 30-year pursuit of Josef Mengele, who became one of the symbols of Nazi mass murder in Auschwitz. The three studies were written and edited by Yossi Chen (Chinitz), a Mossad operative and Holocaust survivor from Lakhva, Poland (now Belarus) who fled the ghetto as a teenager, survived in the forests, and was one of the immigrants aboard the SS Exodus. They were printed as classified studies in 2007, and now they are being revealed in full to the general public for the first time. 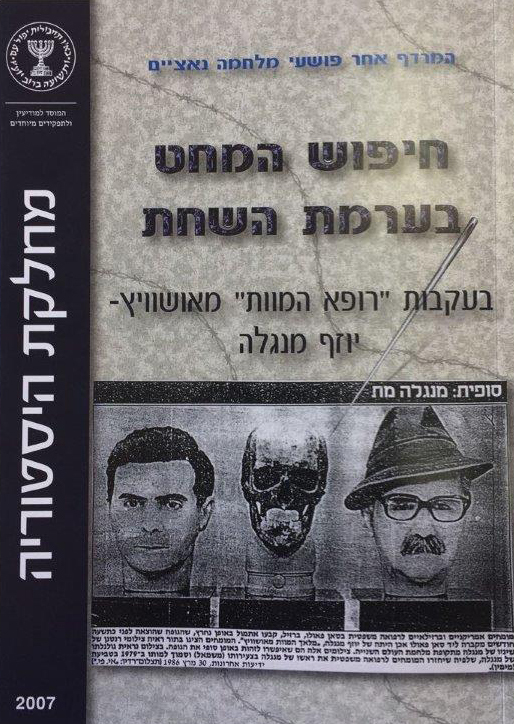 The three part research book conducted by the Mossad on "The Pursuit of Nazi War Criminals" is available in Hebrew only.